Adolph Gottlieb, Nostalgia for Atlantis, 1944, Oil and tempera on canvas 20 x 25 inches. Lori Bookstein started out in the gallery business in 1997, with an Upper East Side space on 78th Street, which she opened with the still-memorable show of “Pat Lipsky’s Black Paintings.” Since then, the gallery has moved to West 57th Street and then again to Chelsea. There it shut up shop in the fall of 2016. But it seems you can’t keep a good woman down, so now Bookstein has returned to her roots, and opened up Bookstein Projects at 60 East 66th Street. At present her exhibition is a little jewel of a group show entitled “Unlocking the Grid” (through April 14). Not all of the15 works in this show are equally memorable, and there is a relatively high percentage of Dead Modernist Males, the Upper East Side’s putative stock in trade. Still, the exceptionally high quality of most of the DMM work explains why it is still so worth looking at and the way that the parts of the show go together to form a harmonious ensemble is remarkable. In the category of “worthy” I would include the Stuart Davis black-on-white gouache drawing, “Untitled (Nautical Forms)” (1932), complete with fish within its irregular grid. I would also include “Dockside” (ca. 1959), a large & sturdy brown & black cross-section of a warehouse with many men at work by Gonzalo Fonseca (1922-1997), an Uruguayan stone sculptor who studied with the distinguished Uruguayan painter, Joaquín Torres García – of whom, more below. In the category of “highly enjoyable” I would put the only brightly-colored work in this show, a highly vital 2016 untitled gouache on paper by Stanley Whitney, and a divinely sweet but little (8 x 10 inch) oil on canvas by Arshile Gorky. This oil was done in the 1930s, when Gorky, John Graham & Willem de Kooning were buddies, all painting cubist still lifes right out of Picasso. This one has two circles, surrounded by squares and a bunch of lines over on the right – all done with black or green outlines on an off-white field. In the category of “best in show” I would put the two works by Torres García, and the Adolph Gottlieb pictograph. The former is represented by two works. One is a sizeable and magisterially dignified dark oil with many small, intricate compartments, called “Constructive Painting” and done ca. 1931. The other is a tiny (5.125 x 3.125 inches) but almost impossibly charming black-and-white pen-and-ink on paper, “Sin Titulo” (1931). This one has tinier vertical boxes containing what looks like coffins, heads and a dressmaker’s dummy. 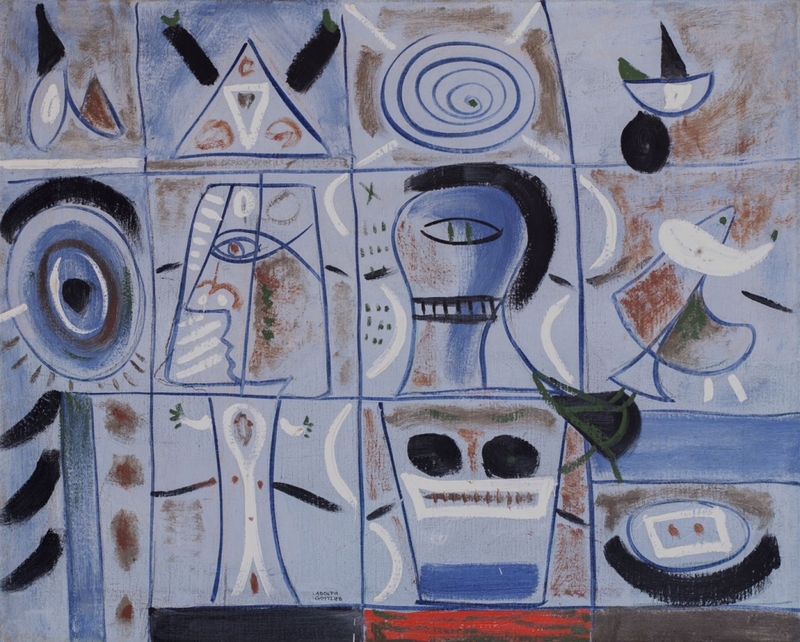 Still, the prize of the collection for me is the Gottlieb pictograph, a relatively small (20 x 25 inches) but rich and delicious “Nostalgia for Atlantis” (1944). With its delicate black-and-white series of little people, eyes and heads each set into a separate square of its grid, this painting has a timeless & hypnotic appeal, not least because of the pale grayish blue of its field.